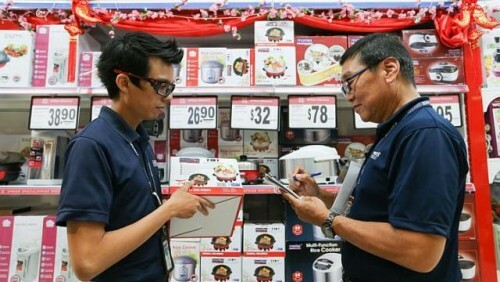 SINGAPORE - More spot checks are being conducted to ensure retail outlets and suppliers comply with safety regulations for gas, electrical and electronic products, with dedicated manpower to do so. Spring Singapore, the regulatory body for consumer product safety and weights and measures, has tripled the number of spot checks since it engaged security company Certis Cisco to help with this task in January 2014. Although the number of checks has tripled over the past year, the total number of offences remain the same - more than 60 per year in 2013 and 2014. Spring Singapore attributed the smaller proportion of offences in 2014 to a higher level of awareness of the safety and accuracy requirements among retailers and suppliers, built up through increased spot checks. While spot checks take place throughout the year, items under scrutiny change according to the occasion, said Mr Sim Geok Seng, its head of consumer product safety and weights & measures. For instance, checks will focus on items such as steamboat pots and gas cookers used for Chinese New Year. Electrical appliances such as adaptors and fans, gas appliances such as gas cookers, as well as electronic products such as computers belong to 45 categories of controlled goods, which must be affixed with a Safety Mark each. Measuring instruments used by retailers must also each have a visible Accuracy Label. There were 60 consumer product safety infringements and five weights and measures infringements a year in 2013 and 2014. The Safety Mark must be renewed every three years while the Accuracy Label should be renewed every year. Selling controlled goods without the safety mark is an offence. The maximum penalty for infringement is a $10,000 fine and/or 2 years imprisonment. Those using weighing and measuring instruments without the accuracy label for trade can be fined up to $2,000. "Purchasing controlled goods without the safety mark could be a safety hazard," said Mr Sim. He also urged consumers to ensure that they buy their money's worth of product by checking that weighing scales come with the accuracy label.